The Saudi monarch's decision to visit Russia, now of all times, marks a new shift in Riyadh's foreign policy, Vyacheslav Smirnov, director of the Scientific and Research Institute for Political Sociology, told Radio Sputnik. "The Saudi monarchy is now actively establishing international relationships," Smirnov said. "Previously, the primary focus of [Riyadh's] foreign policy was the [Middle Eastern] region and the United States. Now after the US began working more closely with Israel, Saudi Arabia has started expanding its international ties." The expert called attention to the fact that Moscow and Riyadh's cooperation in business and energy trade has already borne fruit. The latest visit will bolster the existing economic relations, according to Smirnov. "Saudi Arabia has started investing in the Russian economy, construction, and other spheres," he highlighted. On Wednesday, King Salman bin Abdulaziz al-Saud of Saudi Arabia began his first-ever visit to Russia which is set to last until October 7. The Saudi King's trip to Moscow is nothing short of a historic event, given the fact that it is the first time a Saudi monarch has visited Russia in the history of bilateral ties. Furthermore, the two countries have signed a number of lucrative deals paving the way for the further development of the Russo-Saudi relationship. Following the talks between Russian Minister of Industry and Trade Denis Manturov and Saudi Arabia's Energy Minister Khalid Falih, Moscow announced Wednesday that Saudi Arabia is planning to make investments into more than 25 agriculture, oil and gas projects in Russia. The same day, speaking to The Financial Times Russian, Energy Minister Alexander Novak revealed that the two countries are also going to create a $1-billion fund to invest in energy projects, alongside a deal to invest $150 million in Russia's Eurasia Drilling Company and a $1.1-billion agreement with Russian petrochemical company Sibur to build a plant in Saudi Arabia. According to Kremlin spokesman Dmitry Peskov, the potential for the bilateral cooperation is "far from being unleashed in full," while the two countries are "demonstrating political will" to bolster its development. During his meeting with King Salman bin Abdulaziz al-Saud on Thursday Russian President Putin described it as a landmark event. "This is the first visit of the King of Saudi Arabia to Russia in the history of our relations, which in itself is a very significant event. Our relations have a fairly lengthy history," Putin underscored. The two leaders discussed a wide range of issues including the potential extension of the OPEC+ oil production cut agreement, the Syrian crisis, security issues, defense collaboration and cooperation in the exploration and use of outer space for peaceful purposes. The Saudi monarch endorsed Russia's efforts to find a peaceful resolution in Syria. Speaking to journalists, Russian Foreign Minister Sergei Lavrov emphasized that the two leaders agreed that fighting terrorism should be a number one issue in the region. "King Salman positively assessed the efforts being made on the Syrian settlement within the framework of the Astana format. For its part, the Russian side supports the efforts of the Kingdom of Saudi Arabia to unite the Syrian opposition," Lavrov said. 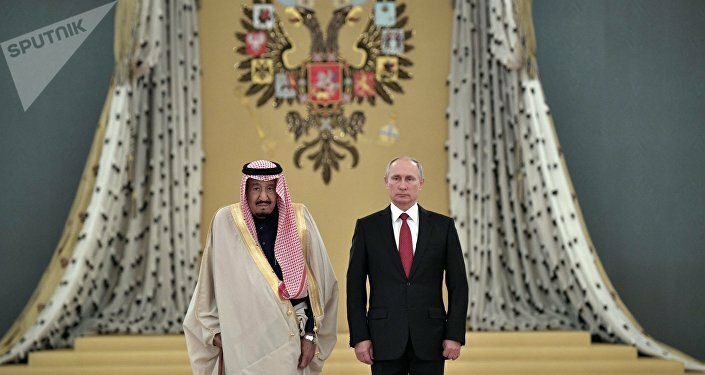 Later the Saudi monarch invited President Putin to Riyadh. "I remember my previous visit to your country. And I will definitely act upon your invitation to visit Saudi Arabia again," the Russian president responded. Assessing the results of the Thursday talks, King Salman bin Abdulaziz al-Saud emphasized that the outlook of Moscow and Riyadh on many regional and international problems coincide. 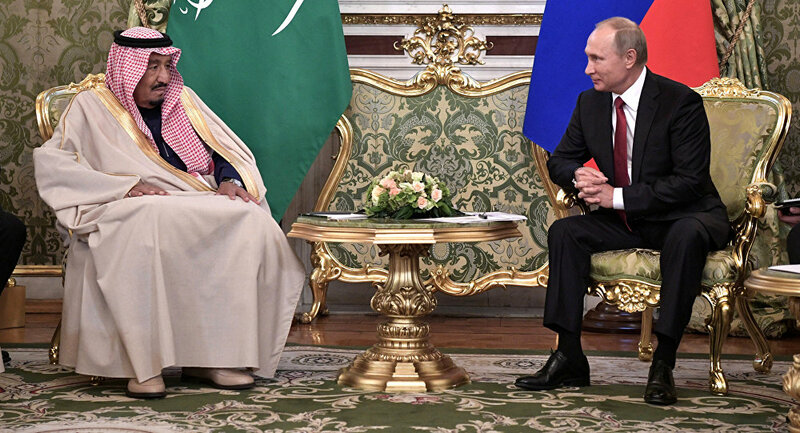 He also reaffirmed the mutual desire to boost Russo-Saudi relations in various spheres. "We are happy to be in a friendly country. We seek to strengthen bilateral relations for the sake of peace and security, for the sake of the development of the global economy," the Saudi monarch stressed.